One of the majestic and memorial complexes of Shahrisabz city is Kok-Gumbaz mosque “Blue Dome”. The mosque was built in 1435 on the foundations of an earlier building with a similar layout. The building is located on the same axis with Kulyala Mausoleum, therefore it became the cathedral mosque of the city. 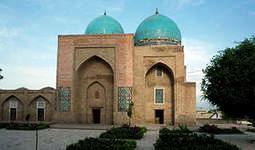 According to the inscription on the portal, the mosque was erected by Ulugbek in the honor of his father Shahrukh. Thanks to convenient location and its majestic size, blue dome of Kok-Gumbaz Mosque can be seen from almost any part of the city. That is why, Kok Gumbaz is considered one of the major monumental buildings of the ancient Shahrisabz city.